Welcome to Bake with Maria. If you are looking to expand your baking repertoire or master moist cakes, flaky pastry and wholesome bread you have come to the right place. I teach a variety of baking classes with the common goal of helping you make delicious baked goods from scratch in a domestic kitchen. I have taught thousands of students over the past 7 years, from the first time baker who has never encountered yeast to the entrepreneur who runs 12 successful bakeries in India. I enjoy spending time in my kitchen meeting new people, baking with them and teaching them new skills that they can use at at home. I look forward to welcoming you! To see what my previous students have to say about my classes, check out Tripadvisor for more than 200 reviews! To keep up to date on new classes and baking adventures, please sign up to my mailing list here or below. For any questions send me an email at maria@bakewithmaria.com. I’ve been baking ever since I was a little girl. I love spending time in my kitchen, kneading bread, seeing the dough develop in my hands, trying out new recipes and making up my own! My passion is home-baked bread and cakes! It was this passion that led me away from corporate life and toward running my own baking school. I received my professional training at Westminster Kingsway College as well as Lakefield College, where I earned a Professional Chef Diploma Level 3 in Patisserie and Confectionery. I have run my school, The Baking Lab, for 7 years. During that time I have taught thousands of students how to bake great tasting breads, cakes and pastries from scratch. Shortly, my School's building will be demolished to make room for the High Speed 2 train line. Seeing this as an opportunity for new adventures, I now teach out of my home kitchen and various schools and colleges in London. On the home front, I am happily married to Marshall and proud mum to two small kids: Kasper & Astrid. When it comes to private classes the sky is pretty much the limit. I can offer 1 on 1 classes in my home kitchen if you are looking to perfect a certain recipe or technique. In my own kitchen I also offer classes for small groups looking for a fun day of baking. Ideas include French Patisserie, Afternoon Tea or a Pizza Making to name a few. I can arrange larger private classes for groups of friends, hen parties and large families. We have previously run - with great success! - bake-off classes, macaron classes and chocolate making sessions. These classes are a great way to enjoy time together. I work with kitchen venues across London so we can find a location and a venue that suits your needs. To discuss options, email maria@bakewithmaria.com. See the full class calendar with dates, times and prices below! Baking is a great team building opportunity. It helps cultivate team work through a little fun competition, whilst creating something delicious from scratch. I can cater to all levels of experience and each event is bespoke to your needs. Previous events include Bake Offs, Pizza and Beer evenings, Christmas Baking classes. 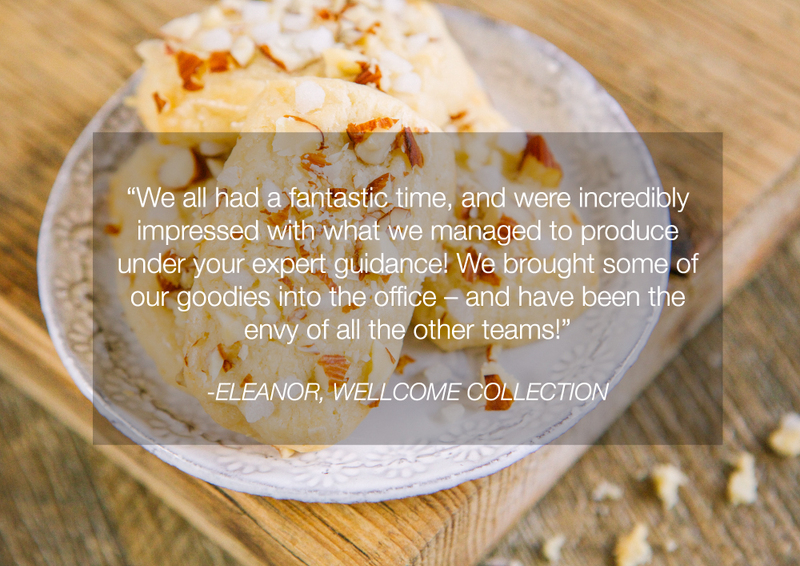 Get in touch with your requirements and I will create a unique baking experience for you and your team. I work with several larger kitchens across London, so I should be able to find a location that accommodates your needs. Previous customers include Google, Bobbins Bicycles, Facebook, Yelp, Lacoste and NHS to mention a few. Looking for a great gift? Our Gift Vouchers are always a hit the recipients. We sell Gift Vouchers for all of our group baking classes. We also do gift vouchers for private group classes. You will receive the Gift Voucher in PDF with a customised text. For any questions and gift voucher purchase, email maria@bakewithmaria.com. The course is suitable for couples, friends and singles. One thing that you will all have in common is your love for good food. For more information, please visit our Tuscany with Maria site here. Do I have to be a great cook to learn how to bake? No, not at all! A little passion for home-made baking is all you need. How do I sign up for a baking class? 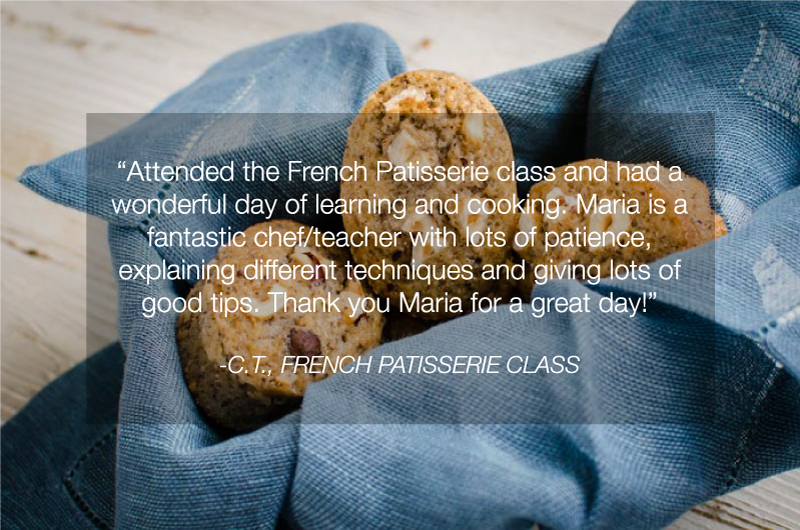 Send me an email on maria@bakewithmaria.com with date and class you would like to attend and I will book you in. 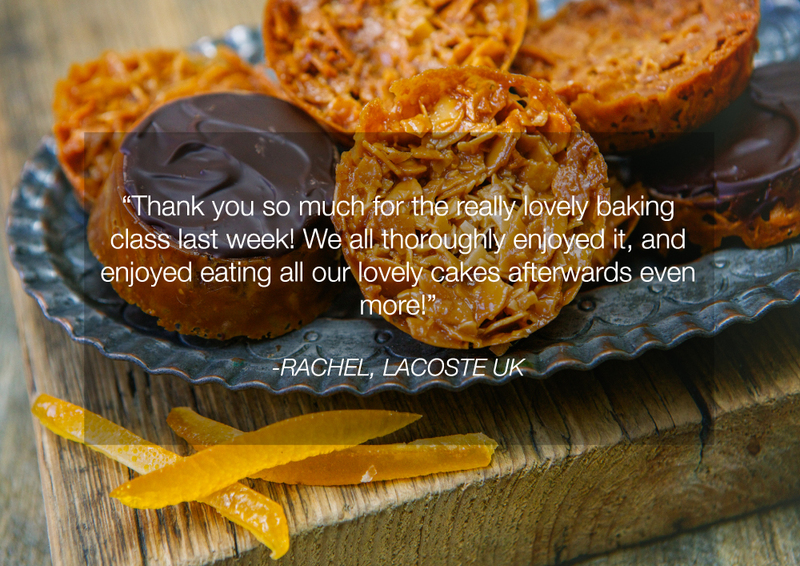 Please contact us before you book a class to let us know of any allergies or dietary requirements you might have. We will then be able to recommend the best class for you. You don’t need to bring anything, just come along and we will supply everything needed for the baking class include an apron to use during the class and boxes to take everything home in. In every class I will take you through all of the steps of home baking. The class is very hands on and we have chosen to make the classes very small in size so you will get lots of personal attention. For the cake baking classes, we will be using KitchenAid stand mixers – they are ideal for cake batters and ensure a light, fluffy texture. Don’t worry if you do not have a stand mixer at home – all the cake recipes can be made using a handheld mixer.